And it's a wrap on the 2016 Canal Music Fest! This year's event was held on June 11, 2016 in 90°+ temperatures… but that did not stop anybody! We had our most successful event to date with 4,000+ folks in attendance to party with us and Absolute Journey Tribute! 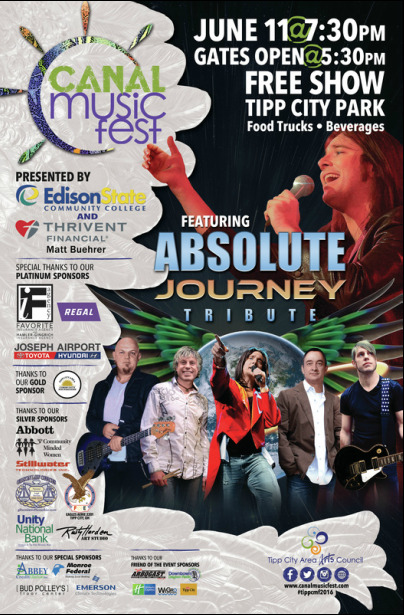 We would like to thank Absolute Journey Tribute and ALL of you—for an awesome Canal Music Fest! Don't stop believing'… another Canal Music Fest is just around the corner. You can find out more about Absolute Journey Tribute on their website and then jump over to Facebook and click "LIKE"! Video courtesy of Absolute Journey Tribute and "shout out" to Riccardo Curzi for all you do!